Many thanks to Sarah over at Maison Cupcake for hosting We Should Cocoa last month. If you haven’t seen all those lovely layer cakes yet, do head over to her site and take a look. I’ve kicked things off with this slightly healthier than your average tiffin: Pecan and Maple Ginger Tiffin. I substituted coconut oil for butter and maple syrup for the more normal golden syrup. I also used a dark 85% chocolate to lessen the sugar content. To make this gluten free, dairy free or both, just swap the digestive biscuits for something more appropriate. I set my froothie blender* to work on this one and used its pulse function to break up the biscuits. This made it a total doddle and all I needed to do to clean the blender jug was give it a quick dust with a clean dry cloth. The link I’ve given is an affiliate link which means I will benefit if you use it to buy an Optimum 9200 high speed blender. Tiffin, refrigerator cake, biscuit cake, call it what you will, is one of my all time favourites. This healthier pecan and maple ginger tiffin version was just as delicious as others I’ve made. It was richly chocolatey and very gingery, although the amaretto managed to shine through. It was crunchy from the pecans and biscuits, chewy with the fruit and had an overall fudgy texture which made it absolutely scrumptious. If this pecan and maple ginger tiffin doesn’t appeal, maybe one of my other tiffin recipes will. Thanks for visiting Tin and Thyme. 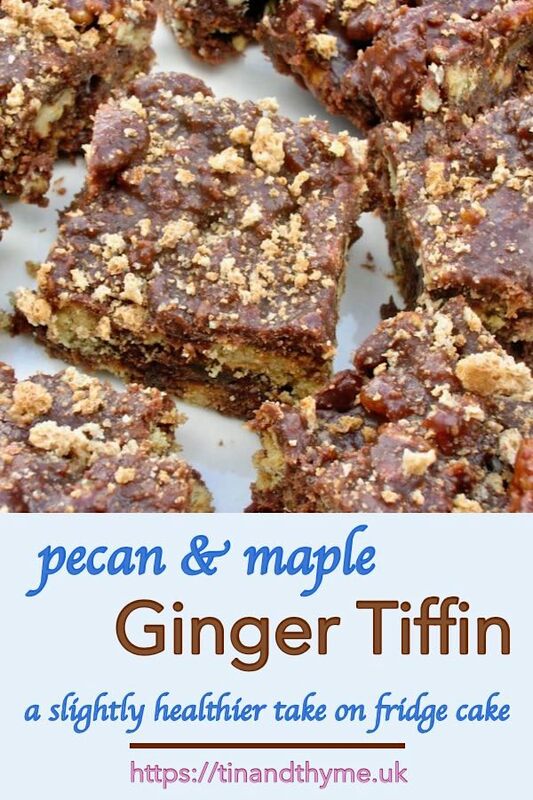 If you make this pecan and maple ginger tiffin, I’d love to hear about it in the comments below or via social media. Do share photos on social media too and use the hashtag #tinandthyme, so I can spot them. For more delicious and nutritious recipes, follow me on Twitter, Facebook, Instagram or Pinterest. Pecan and Maple Ginger Tiffin. PIN IT. A rich, fudgy and very tasty tiffin which is a bit healthier than your average, using coconut oil, maple syrup and very dark chocolate. Melt the coconut oil and chocolate in a pan over low heat. Remove from the heat and add the syrup, jam and Amaretto. Stir until combined. Break the biscuits into bits of varying sizes (I used the pulse function on my blender). Place everything but the amaretti into a bowl, give a good stir, then press into an 20 cm (8") sq. mould. Crumble the amaretti over the top and place in the fridge for a good hour or so to set. Cut into 12 pieces and enjoy. The longer this is left to set, the easier it will be to cut cleanly. Any fruit or nuts can be used as well as, or instead of, the ones given. Thanks Karen, I have a terrible weakness for it too. Mmmm lovely flavours. I would like to say it would be perfect to help my revision but it probably isn’t because I’d just sit and eat the whole tray! Oh, I know exactly what you mean Laura, it’s way too moreish for our own good. Hope the revision is shaping up. Oh I do love tiffin and this one sounds a bit special! Nice recipe Choclette. Thanks Jac, tiffin is one of my many downfalls. Oh wow – these look great! Definitely a good Easter treat. Look forward to entering WSC (actually going to do it this month as well, not just talk about it). Loving the look of the new blog, by the way! Pecan and maple goes so well together. This sounds delicious. Thanks Dannii, it was far too delicious. But the coconut oil worked well and I shall use that again – makes things a little less naughty. They sound fantastic Choclette, loving the use of coconut oil in there. I shall try my best to enter We Should Cocoa this month, it’s been quite a while! It’s been ages Lou! No bake will be a fun one for your little chefs to get involved in. Coconut oil is a fantastic ingredient. This sounds delicious. I am very keen on the use of coconut oil here too! Thanks Helen. Coconut oil is a fantastic ingredient and it combines beautifully with chocolate. I haven’t eaten tiffin for a very long time and I love it. This definitely has my kind of flavours and I could certainly eat far too much of it. I’m always in need of anything that’s a little healthier. You are a wise man Phil. I have a bad habit of wanting something sweet and dashing into the kitchen to make tiffin. Of course, once made, it has to be eaten. I love tiffins and it’s so versatile as you can make so many variations of it. Great theme too for WSC. I love the name ‘Tiffin’. It always sounds like such a fun thing to eat. It’s really easy to make GF too! I also love using coconut oil in biscuitty treats…. I think it makes them extra crunchy…..
Now…… what to make no bake????? This is a delicious looking cake. It is going on my to do list. Hello, thanks for visiting and commenting AND liking my tiffin 🙂 My to do list is so long, I’ve given up looking at it. Ah, the joys of the Froothie. I am yet to make a dessert with it. Yours looks lovely! Thanks Michelle. I’ve made loads of stuff with my froothie, but have only managed to blog a tiny percentage so far. Twitter sharing button not working properly, i.e. no link to post included. Hi Michelle. Thanks for letting me know. I’ve just tried both my twitter buttons – sharaholic at the top and the one at the bottom of the post and both seem to be fine, so maybe it was just a blip? Oh tiffin is my nemesis!! I can’t stop eating it! So a healthier version, even slightly healthier, is the dream for me. This looks amazing. Haven’t used my Froothie for crushing yet, must have a go. Ah me too Sarah, I love the stuff and try not to make it too often. This recipe does make you feel, if not exactly virtuous, a little less guilty.